Generations and Their Gadgets – from Pew – Media! Tech! Parenting! Click for a larger copy. 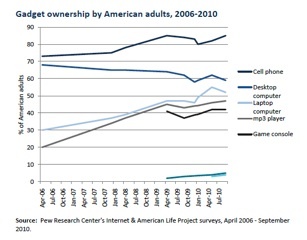 The Pew Internet and American Life Project just published (Feb 3, 2011) Generations and Their Gadgets (overview). Researchers surveyed 3001 Americans in late 2010 and discovered a lot about how technology tools and gadgets are used. Click on the image on the right to get a larger image of the summary chart. I often think about how members of my family use computers, laptops, cell phones. Our three generations are a microcosm of gadget world users. Are we average? Do we have more gadgets or fewer? I don’t know. My mother (83) uses a Dell desktop and occasionally a Dell laptop. My dad (87) uses a Dell laptop and an iPad. They have a cell phone and a landline and are contemplating removing the landline. Mom e-mails a lot, Dad a little. My husband and I have a desktop, a couple of laptops, an iPad, an iPhone, a Blackberry, and a basic cell phone. I text, he does not. We both e-mail a lot. We, too, are contemplating removing the landline. My daughter and her husband have all of the above, but more of them, as well as iPods and two iPhones. They text most of the time and e-mail much less Their house does not have a landline. While the people age 75 and older own the least number of gadgets, the generation just behind them owns and uses a lot more. The next generation that Pew surveyed, the older boomers, owns just about everything. My parents are part of a small group of older seniors who have embraced computers and gadgets. Cell phones are by far the most popular gadgets. Desktop computers are in the mainstream with adults age 35-64. Younger adults are more likely to own laptops. Older models tablet computers never made it into the mainstream, and they may not, given the wave of iPad and iPad-like devices. Digital citizenship concepts are important for all ages to understand. Children and teens who think they know more about technology than their parents may be in for a surprise. Many of their parents are quite proficient with technology, and the skills of these adults can only grow stronger. Check out the full Pew report and its amazing charts and graphs.